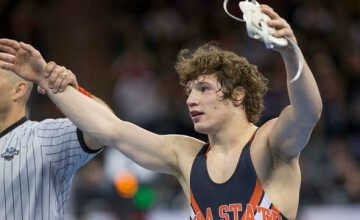 STATE COLLEGE, Pa. – Oklahoma State’s wrestling team finished the dual season 13-3 after falling to No. 1 Penn State in the NWCA National Duals championship match, 29-18, on Sunday evening at Rec Hall. The Nittany Lions snapped the Cowboys’ 11-match win streak, recording bonus points in four of their six victories. Penn State gained momentum quickly with a controversial pin at 125 pounds and a decision at 133 pounds to jump out to a 9-0 lead. Things went in favor of the Cowboys at 141 pounds. Coming off his first loss of the season, No. 1 Dean Heil grinded out a solid win over No. 14 Jimmy Gulibon to give the Cowboys their first win of the night. A wild third period saw the two exchange nine points collectively. Heil’s two takedowns during the third gave him the advantage and a 9-5 win. At 149 pounds, No. 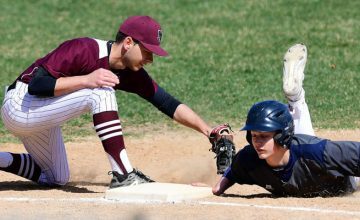 12 Anthony Collica was edged out by No. 1 Zain Retherford, 4-1, and the Pokes fell at 157 pounds as Penn State recorded another pin. No. 1 Alex Dieringer closed out his dual career with a second-period technical fall over Geno Morelli, 17-2, at 165 pounds, giving the Cowboy senior a 63-2 mark in dual competition. His four takedowns and two four-point nearfalls ended the match in 4:36. With the victory, Dieringer is tied with OSU great Mike Sheets for third-best win streak in program history as he claimed his 74th-consecutive win. PSU responded with a tech fall at 174 pounds to extend their lead to 23-8 with three matches left. Twelfth-ranked Nolan Boyd closed the gap, keeping the dual in reach for the Pokes as he recorded his third win over a top-10 opponent. Boyd trailed No. 6 Matt McCutcheon, 3-1, after the first period. He took the lead in the second period with an escape and a takedown, but the bout was ended early as McCutcheon injury defaulted due to a knee injury. No. 1 Morgan McIntosh picked up a third pin for the Nittany Lions at 197 pounds, sealing the dual win for Penn State. Picking up a major decision in the heavyweight bout, No. 5 Austin Marsden also finished up his dual career with bonus points. The senior took on Jan Johnson and jumped out to a quick start with two takedowns and a four-point nearfall to take a 10-0 lead into the second period. Johnson scored a reversal and a takedown in the second and third periods, respectively, but it was not enough to match Marsden’s skill as the Cowboy won, 18-6. Oklahoma State will return to action on March 5-6 at the Sprint Center in Kansas City, Mo., seeking its 50th conference title at the Big 12 Championships. Bringing you the best in sports since 2003. Reporting on local, collegiate and professional sports, SportsPage Magazine has you covered. Copyright © 2017 SportsPageMagazine. Powered by Wordpress.